There is a common belief when it comes to managing people—especially at the senior VP and executive levels—that the higher you are in your position, the less you actually need to provide any sort of hands-on management to your direct reports. The thinking goes something like this: You had to be bright and smart to get to this executive level. Similarly, the people who report to you directly must also be very smart, or they wouldn’t have gotten to their positions. Therefore, they should know their jobs, and you should rarely or never need to tell them what to do in very specific terms. That’s the myth. Here’s the reality. To what degree does this person have the skills and expertise needed to do the task? To what degree are you confident that your perception of the person’s abilities is actually true? To what degree does the person you have in mind agree with your own assessment? Each time you delegate a task, you need to weigh these three factors and determine how involved you need to be. There is no one-size-fits-all. Now, let’s clarify what it means to delegate, and then talk about why most managers are doing it wrong. The common perception is that as a top-level executive, you are supposed to primarily operate at levels 4 and 5. In fact, you may feel that it’s actually insulting to simply tell your people what to do—especially with detailed instructions—and expect them to do it. Well-intentioned consultants would say you are “micromanaging” and that is bad. Unfortunately, delegating directly to level 4 or 5 often leads to breakdowns. 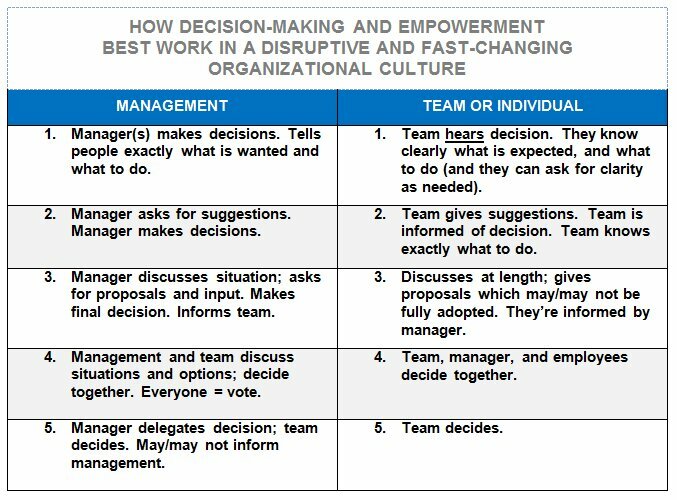 This is especially true in today’s organizational culture, in which change and disruption are the norm. In an environment like this, it’s illogical to expect direct reports—no matter how competent they are—to become knights who go forth on their own, find the holy grail (without a map and maybe without even understanding what a grail is), and report back when they’re done. It never worked like that in the past, and it definitely does not work like that today. Very often, people who get knighted go forth and do their best based on what they think the boss expected. Then, when they bring the results back to their boss, the boss says, “No—that’s not what I wanted.” They look bad, the boss is frustrated, and the blame game begins. To avoid this scenario, you need to ask yourself: How badly do I really need this task that I’m delegating to be carried out perfectly? The more important the task is, the more you need to ensure that your direct reports truly have the skills, experience, and information they need to carry it out. If the task is crucial, this means having a conversation with each person involved, asking lots of questions, and making sure that the person is capable of doing the job. Do NOT simply accept “Don’t worry, boss, I can do this.” This is what people think you want to hear, but it’s not what you need to hear. Frequently, people won’t admit up front that they’re unprepared for a task because they’re afraid that they’ll get fired or they want to save face. Other times, people aren’t even aware that they’re lacking key skills or data (which is a dangerous—and these days, common—situation). This is why you can’t accept “I can do this” at face value. Part of your job is to help the people under you identify and address their blind spots, without making them feel stupid. And part of their job is to be open to your masterfully helping them gain awareness of their own blind spots. Your ability to do this, and their ability to accept and learn, will increase tenfold the expertise that each of you have to offer. ​Remember: Most people in the job market who get promoted fast have a narrow band of expertise in one area, but may have little or no knowledge outside of that area. Others are great generalists but have never actually gotten their hands dirty doing things that are relevant to today—not three years ago. When skills and experience are lacking, or your direct reports don’t know how to make good decisions (another skill that needs to be taught), you can delegate at level 5 until the cows come home, and it will keep coming back to bite you in you-know-where. 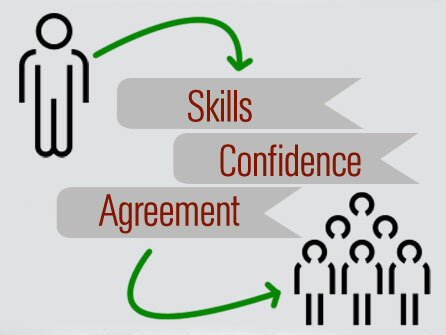 What’s more, your team, who only want to succeed and to help you succeed (assuming that you hired well, treat people with respect, and demonstrate your own competence) will become very demotivated when you keep saying “Jump,” they keep saying, “How high? We can and will do this!”, and then you’re disappointed in their results. So don’t just say, “Do it.” If necessary, be ready to roll up your sleeves, get dirty, and really find out the details of what’s needed. How do you know when to delegate and levels 4 and 5? The answer is powerful: you and the team or other individual both agree with candor, and the results that you and the other(s) want show up. Also, make it clear to your team that it’s their responsibility to be open with you—for instance, to say, “I’m not exactly sure what you want me to do,” or “This is what I plan to do step by step—is that what you want?” or “I have expertise in this and this, but THAT will be new to me—can we meet weekly and update?” Then reward their openness by giving them the support they need. Do exactly what I have asked you to do: Don’t deviate from my instructions, since I have researched the options and determined my preference. Research the topic and report back: After we discuss it, I’ll tell you what I want you to do. Research the topic: Outline the options with the pros and cons for each, and make a recommendation. If I agree, you can move forward with that approach. Make a decision and then tell me what you did. I trust you to do the research, make the best decision you can, and then keep me in the loop. Make whatever decision you think is best. No need to report back. I trust you. 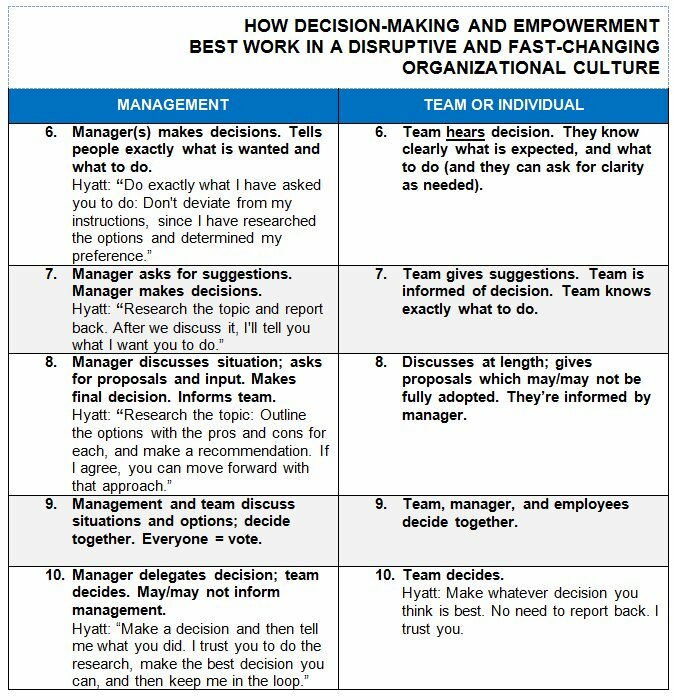 While my model looks at the five different ways to delegate a task, Hyatt’s model looks at the issue from a different angle: It tells you how to communicate your expectations at each level so that your direct reports are absolutely clear on what you want. All stages of this model are empowering. When people don’t know what to do and you tell them, they’ll be grateful—and they’ll also be more likely to give you the results you want. When people know exactly how much and what type of input you need from them, they’ll be more efficient. When collaboration is indicated, a good dialogue will enable your team to make the best decisions possible. And when you conclude that a person or team truly is capable of handling a task without your input, you’ll avoid over-managing. Delegating—and communicating your expectations clearly and smartly when you delegate—takes work. However, the payoff is huge. It will make your team respect you more, and vice versa. It will maximize your performance and minimize your costs. And it will ensure that despite change, disruption, and sometimes utter chaos, you will get the job done as efficiently and effectively as possible.